If New Jersey is going to recover its reputation for innovation and economic vitality, state government needs to dramatically change the way it raises and spends money. 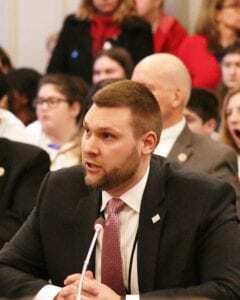 In testimony prepared for hearings by the Senate and Assembly budget committees this week, NJBIA Vice President Andrew Musick said businesses want a fiscally sound budget where spending levels and tax rates are predictable. Gov. Phil Murphy’s proposed budget asks for yet another tax increase despite long-standing economic growth, historically low unemployment, and the fact that New Jersey is already the highest taxed state in the nation. Musick pointed out that the state also is enjoying CBT revenue collections well beyond what was predicted, due to the increase in corporate taxes enacted last year. Still, Murphy has proposed increasing the income tax on millionaires by lowering the threshold for the top tax rate, 10.75 percent, from $5 million in income to $1 million. Musick questioned why New Jersey isn’t raising enough revenues during a period of such strong economic growth. “We are concerned about the impact that this would have on revenue volatility during a time of recession, as a recent report by Moody’s Investors Service discussed the dangers of relying on increased taxes on high income earners, especially without serious structural reforms,” Musick said. Not surprisingly, these tax increases are fueling increased government spending. Musick noted that the state budget will have increased by more than 11 percent over two years if Murphy’s budget proposal is enacted. The governor’s budget does include savings that offset some of the increased spending. Musick said the more than $1 billion in savings, the majority of which come from changes to government employee health benefits, is a good first step, but more needs to be done. “NJBIA believes the state needs to immediately engage in structural reforms that comprehensively address underfunded pensions and rising health benefit costs to address our ever-increasing, long-term debt obligations,” Musick said.